Cambodia has maintained its high growth at the average rate of 7 percent for decades where agriculture, construction, tourism and garment & footwear sectors are the main sources of such robust growth. Cambodia’s overall total trade reached US $ 25.55 billion in 2017. Its exports valued at US $ 11.27 billion in 2017, increased 11.96 percent as compared to 2016 while imports increased to US $ 14.28 billion, changed 15.47 percent. Cambodia imported significantly from Asia up to 92.74 percent of total imports in 2017. Key imported commodities are vehicles, petroleum products, motorbikes, and other consumable goods. The first export destination is European continent which accounts for 40.22 percent followed by Asia which accounts at 28.62% of total exports in the same year. Garment, footwear, rubber, textiles, fish products and other agricultural products are top exports to the globe. Though economic interaction between India and Cambodia are limited. However, trade and investment figures have changed positively in recent years. India exported US $ 120.27 million worth of good to Cambodia, showing 9.32 percent increasing in 2017 while imports valued at US $ 48.02 million, increasing by 11.33 percent at the same year. Total trade reached US $ 168.02 million in 2017, increased 9.71 percent as compared to 2016. To promote trade and business relations, Hon’ble Minister of Commerce, Trade and Civil Aviation, Sri. Suresh Prabhu, visited Cambodia in May 2018 to participate in Indian - CLMV Business Conclave in Phnom Penh and held bilateral meeting with Cambodian Prime Minister and Minister of Commerce, H.E. Pan Sorasak on trade improvement and connectivity. India and Cambodia jointly organized some events in Cambodia such as 5th India-CLMV Business Conclave in May 2018 and Incredible India Road Show in May 2018. Besides organizing events in Cambodia, Cambodian government official and business delegation were invited to participate in Advantage Assam-India’s Expressway to ASEAN in February 2018, FICCI Higher Education Summit, Saurastra Vepar Udyog Maha Mandi (SVUM) in July 2018, and other mega events and Expo in India. On bilateral investment front, India invested US $ 19.8 million in 2016. There are few Indian companies which are investing in multiple sectors including Mesco Gold, Bajaj Cambodia, and Sram Mram Limited. The Government of India is planning to create a Special Purpose Vehicle for US $ 68.27 million fund to increase Indian economic presence in CLMV. We are negotiating India-Cambodia Bilateral Investment Treaty. Cambodia and India have signed agreements on cooperation in the areas of but not limited to agriculture, scientific and technological cooperation, entrepreneurship development and tourism. The economic relations between the countries are also facilitated by the Mekong-Ganga Cooperation and the ASEAN-India Free Trade Agreement. India - Cambodia trade has been growing steadily in the last few years. The total trade between India and Cambodia stood at US $ 188.02 million in 2015, which indicated a 10.66% increase over the corresponding figure for 2014 (total trade US $ 169.90 million). Of this, exports from India were US $ 145.66 million (a decrease of about 5% over 2014) and the imports from Cambodia were US $42.36 million (an increase of 157.66%). While the overall trade has shown a continuous trend of growth, the trade basket remains very narrow. Indian exports are dominated by pharmaceuticals, yarn, leather and some engineering items. Cambodian exports are mostly primary products. However, her exports declined in 2016. Indian exports were US $ 110.01 million and Cambodian exports to India were US $ 43.13 million. Indian exports showed a decline of -24.47% and the Cambodian exports registered 1.81% growth. The drop in Indian exports in 2016 is largely attributable to drop in exports of Oil Meals, Cotton and other yarns (possibly due to supply/demand linked to regional apparel manufacturing chains) and milled products. The was a positive change in total trade volume from 2016 at US $ 153.14 million to US $ 168.02 million in 2017 with 9.71% growth. Potential items of exports from India could include machinery, auto parts (two/three wheelers), drugs and pharmaceuticals, agricultural products including agricultural product processing industry, leather and leather products. With a positive growth, Foreign investment inflow to Cambodian is expanding continuously. 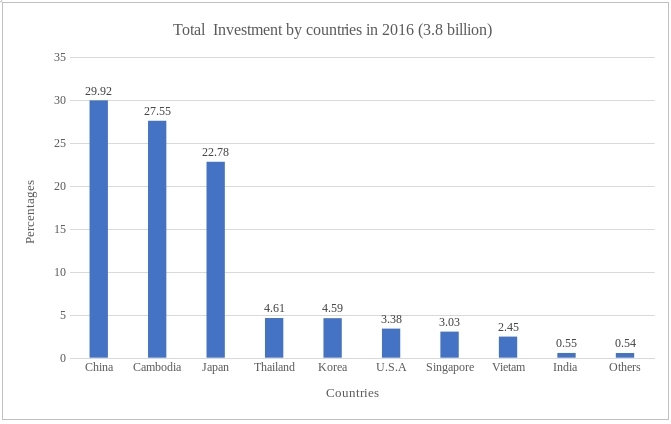 According to The Council for the development of Cambodia, total foreign investment reached US$3.6 billion in 2016 and was 24% increase from 2012 to 2016. In the same year, India investment reached US$19.8 million (0.55%) out of overall $3.6 billion and rank in top10 for foreign investor in Cambodia. The major investment from India are in the field of agricultural machinery, power, construction and mining.